Small wonder that the hotel attracted, and continues to attract, the rich & famous: few have such magnificent views over the Bay of Naples as the Excelsior Vittoria – Marilyn Monroe, Jack Lemmon and Sophia Loren all stayed here during the fifties and sixties. From a more historic perspective, though, there is a distinctively musical theme, with the hotel having played host to both Enrico Caruso and Richard Wagner. Built in 1834, the hotel has been consistently owned and managed by the Fiorentino family - one of very few founding hotelier families remaining in Italy today. 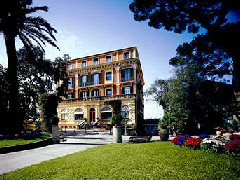 Grand Hotel Excelsior Vittoria is rated as five-star and is made up of three separate buildings which were all constructed between 1834 and 1880. It possesses 98 guest rooms and suites, restaurants, bar and an outdoor swimming pool which is open seasonally.